On Saturday, November 17 at 2 p.m. geologist Bruce Bjornstad will be giving a talk, Powerpoint and Q&A session at Auntie's Books. The topic is his latest book, On the Trail of the Ice Age Floods: Northern Reaches. 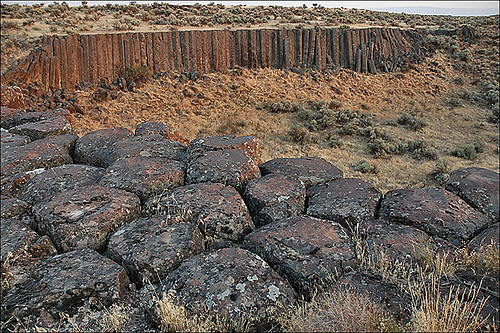 This guidebook details sites near Cheney, Spokane, north Idaho, and the channeled scab lands that are accessible to visit and study the effects of the calamitous flooding of prehistoric Lake Missoula. 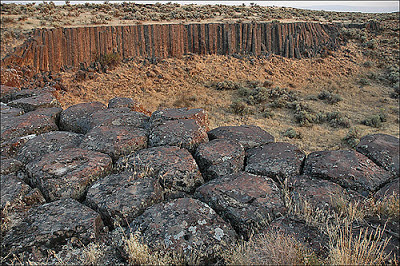 The floods are of course responsible for much of the unique topography of the inland Northwest, as well as our bath tub ring of mammoth skeletons. You can learn more at the Ice Age Floods Institute. This is a fascinating topic, as well as an opportunity to support our local independent bookstore! See you there. A special feature of this conference are the morning "Conversation Starter" sessions. These begin at 8:30, have no competing events (other than field sessions) and have a reading list provided beforehand. I missed yesterday's conversation starter, Good vs. Good on Public Lands, so made sure to catch Telling Richer Stories of Place today. Participants included Keith Magee from The National Public Housing Museum, Edgar Garcia of the City of Los Angeles; Michelle Magalong from My HiFi in Los Angeles, and Aissia Richardson of Uptown Entertainment in Philadelphia. It turned out that "Richer Stories of Place" meant including more non-white actors in our stories of place--which is a worthy goal. We heard a lot of interesting stories about oral histories, working with some very dilapidated properties, and trying to bridge the chasms between developers, community groups and preservationists. My favorite line from the session was when Richardson recounted how she would urge community organizations to participate in planning by telling them: "If you are not at the table, you are on the menu." For my mid-morning session I checked out Indigenous Cultural Landscapes: New Ideas on Place. The presenters were from a variety of organizations around the Chesapeake Bay, working together on the Piscataway Cultural Landscape Initiative, which seeks to become a national model for working with native cultural landscapes. It was a fascinating and wide-ranging session. I especially appreciated Deanna Beacham's obwervations on the Park Service's 1963 Leopold Report, which advocated caring restoring public lands "to primeval wilderness." Beacham noted that "wilderness" is not even a word in native vocabularies, and called the Leopold report "profoundly ignorant" on native shaping of the North American landscape. The other great thing about the Cultural Landscapes sessions was this--they left time for and solicited audience interaction. About half the session was set aside as a conversation, and session facilitator guided what was absolutely the best audience-panel interaction I have ever seen at a conference. Well done. At noon I checked into one of the 25 minute power sessions at the exhibit hall, this one a demonstration of the National Public Housing Museum's 3D laser scanning project. The YouTube we watched is here. The short version is that the museum, which hope to renovate an abandoned Chicago public housing project into a museum, partnered with the Visual and Spatial Technology Centre (VISTA) at the University of Birmingham to create an extraordinarily detailed 3D scan of the building, used in planning and fundraising and to give remote visitors a 3D immersive experience. My first afternoon session was Washington's Maritime Heritage, which described the work that has gone into a proposed Washington State Maritime Heritage Area. You can read the report here. I cannot do justice to this rich session in a few sessions. The high point was seeing the blending of historic sources and GPS and other technologies that went into identifying and mapping the 2300 miles of shoreline and 500 historic properties in the initial survey. I have been thinking about a northwest National Heritage area for some time, so I took a lot of notes. Watch this space for a future plan. Finally, I attended Landmarks of the Future: The Heritage, Legacy and Promise of World’s Fairs. This session featured Knute Berger, author of the terrific Mossback blog as well as Pugetopolis: A Mossback Takes on Growth Addicts, Weather Wimps, and the Myth of Seattle Nice, and Bill Youngs, author of The Fair and the Falls: Spokane's Expo '74 : Transforming an American Environment. The two compared the Seattle's and Spokane's fairs in 1962 and 1974. 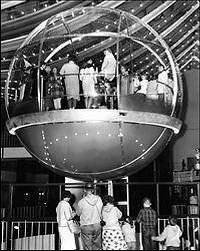 Seattle's theme was the future and the long-term goal was to leave Seattle with the seeds of its high-tech future, such as the monorail that would eventually link the entire region, the Space Needle, and the Bubbleator. a dozen years later Spokane focused its fair on the environment, with the long-term goal of transforming a tangle of rail yards and parking lots into Riverfront Park. Honestly I was blown away by the interest and quality of the sessions today. This is my first National Trust conference, but already I am making plans for next year, in Indianapolis. The National Trust for Historic Preservation is in the house! This is one of the largest conferences that Spokane has hosted, certainly the largest history-themed conference, and it seems to be going really well. Today I gave a presentation, learned about plotting historic trails, explored three sites of a proposed new national park, heard some dubious historical interpretation, and met a lot of interesting people. In the afternoon I attended two sessions. Happy Trails! Going to Great Lengths to Preserve National Historic Trails was fascinating but should have been subtitled Going to Great Lengths to FIND National Historic Trails. The three panelists described their work on three historic trails--Dave Crowley of the BLM on the Oregon Trail, Angie Krall of the Forest Service on the Old Spanish Trail, and Julie McGilvray of the NPS on the Butterfield Stage Route. What fascinated me was the incredibly painstaking work each person did with old maps, surveyors notes, and painstaking archaeology to pinpoint the routes and campsites of these long-vanished routes. Their identifications hinged on such items as a copper shell casing, a broken Spanish bridle bit, and a shard from a whiskey bottle. Locating these routes is fine-grained detective work. My second afternoon session was Interpreting the History of the Atomic Age. This session featured presenters for the three sites of the proposed Manhattan Project National Monument. Ethiel Garlington explained some of the preservation issues at Oak Ridge in Tennessee, Colleen French ("I'm just a girl who fell in love with a reactor") explained the special problems at Hanford where historic preservation takes a necessary back seat to cleaning up hazardous materials, and Heather McClenahan told us about Los Alamos. One of the reasons for the failure was unintentionally made clear during the session, where two of the five presenters engaged in weird digressions from their subjects to deliver endorsements of the decision to drop the atomic bombs on Japanese cities. Session chair Sean Smith of the National Parks Conservation Association stated that there was absolutely no evidence that the Japanese were considering surrender and gave very high estimates of casualties if the Americans had invaded. McClenahan added at the end of her presentation (which until that moment had been about preserving historic buildings in New Mexico) that some people disputed the high casualty figures if an invasion had been necessary but how do those people explain then why the U.S. manufactured so many Purple Hearts for the invasion of Japan that the military did not use up the the supply until recently? These asides were both completely irrelevant to the presentation and bad history. Smiths claims were naive. Japan sent out what many historians believe was a peace feeler to the United States before the dropping of the first bomb. There is plenty of evidence that some of the high casualty figures for an invasion of the Japanese mainland were manufactured after that war as post-facto justifications for the use of atomic bombs on civilian populations. And as for the purple hearts surplus--the United States also exited the war with a surplus of toilet paper, so much that some government agencies used WW2 army toilet paper into the 1960s. Gentle reader, I will allow you a moment to make your own joke here. You do not have to be opposed to the decision to drop the bomb (I personally feel it was the right call) to object to these presentations. Besides being poor history, the pro-bomb arguments were wildly out of place and do real damage to the laudable cause of creating this national park. It was very like hearing a presentation on why we need a new Civil War park interrupted by an explanation of how the South was right about states rights, or "Manifest Destiny: Not So Bad" as the tagline for a new westward expansion monument. In the question session an audience member mentioned that the mayor of Nagasaki had sent a letter to President Obama, opposing the creation of the park. I wonder why? I should not make too much of this--both presenters spent only a few minutes defending the bomb in otherwise excellent presentations. I look forward to tomorrow!